Hart Publishing has a new volume which looks very interesting. Hart Publishing has offered to send a free copy in exchange for ad placement. Given my current research focus on IP and Antitrust, I have decided to accept the offer. For decades, the debate about the tension between IP and antitrust law has revolved around the question to what extent antitrust should accept that IP laws may bar competition in order to stimulate innovation. The rise of IP rights in recent years has highlighted the problem that IP may also impede innovation, if research for new technologies or the marketing of new products requires access to protected prior innovation. 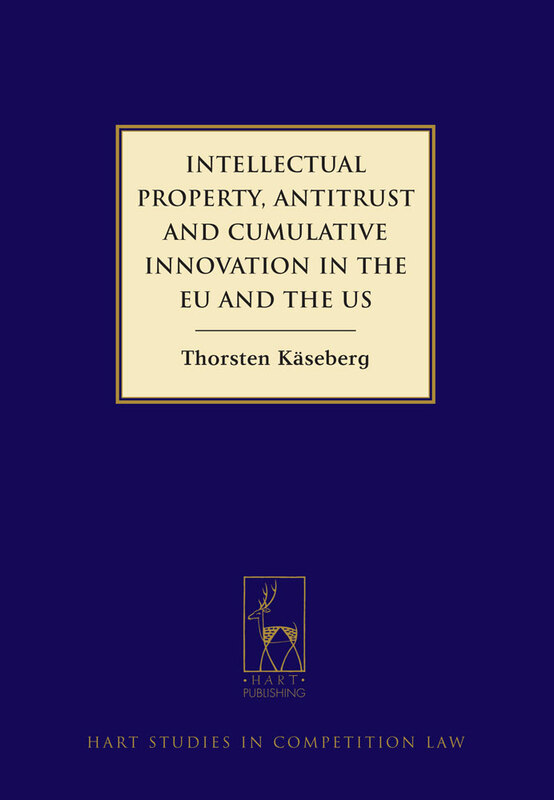 How this ‘cumulative innovation’ is actually accounted for under IP and antitrust laws in the EU and the US, and how it could alternatively be dealt with, are the central questions addressed in this unique study by lawyer and economist Thorsten Käseberg. Taking an integrated view of both IP and antitrust rules – in particular on refusals to deal based on IP – the book assesses policy levers under European and US patent, copyright and trade secrecy laws, such as the bar for and scope of protection as well as research exemptions, compulsory licensing regimes and misuse doctrines. It analyses what the allocation of tasks is and should be between these IP levers and antitrust rules, in particular the law on abuse of dominance (Article 102 TFEU) and monopolisation (Section 2 Sherman Act), while particular attention is paid to the essential facilities doctrine, including pricing methodologies for access to IP. Many recent decisions and judgments are put into a coherent analytical framework, such as IMS Health, AstraZeneca, GlaxoSmithKline (in the EU), Apple (France), Orange Book Standard (Germany), Trinko, Rambus, NYMEX, eBay (US), Microsoft and IBM/T3 (both EU and US). Further topics covered include: IP protection for software, interoperability information and databases; industry-specific tailoring of IP; antitrust innovation market analysis; and the WTO law on the IP/antitrust interface. Dr Thorsten Käseberg, a lawyer and economist, was a case-handler at the European Commission’s Directorate-General for Competition between 2009 and 2011. He is currently working in the competition policy unit of the German Economics Ministry and was previously a lecturer in the Faculty of Law and Faculty of Economics at the Humboldt University Berlin, and a research assistant at the law firm Cleary Gottlieb Steen & Hamilton in Brussels. If you would like to place an order you can do so through the Hart Publishing website (links below). To receive the discount please mention ref: ‘CCB’ in the special instructions field. Please note that the discount will not be shown on your order but will be applied when your order is processed.